Frankly, it's not something we like to talk about. There is an unfortunate stigma to acknowledging workplace dysfunction, let alone trying to grapple with the problem. But negative behaviors such as incivility, toxicity, deviant behavior, workplace politics, and team and leadership dysfunction not only make the library a stressful workplace, they also run counter to the core values of librarianship. An important tool for library leaders and managers as well as library staff, this book examines these negative relationship-based issues and suggests practical, research-based solutions by discussing the importance of understanding oneself as related to the library workplace; identifying attributes specific to libraries that foster personal success; showing how organizational dysfunction is rooted in problems such as poor communication, inadequate leadership, and lack of employee engagement; breaking down relatable scenarios to analyze what's behind them and how to defuse them, ranging from a gossipy coworker who fails to contribute to the organization to workplace bullying and mobbing; exploring causes, results, and potential solutions in the areas of cyberloafing, fraud, theft, and sabotage; delving into the importance of conflict management, surveying a variety of approaches and applications; examining the use of teams in libraries and the impact of favoritism, nepotism, and sexism; and providing techniques for successful collaboration, leadership, organizational communication, and other key management topics. 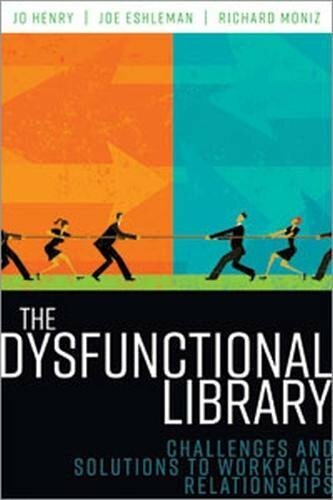 By tackling the dysfunctional library head on, managers as well as library workers who find themselves in a toxic situation will be poised to better meet library goals and move the library forward. If you have any questions about this product by American Library Association, contact us by completing and submitting the form below. If you are looking for a specif part number, please include it with your message.